MFI Accuracy International (AI) Style Muzzle Brake for Remington 700 SLIP ON TYPE for .223 Caliber with Non-Threaded Barrel with O.D. @ 0.870". Designed specifically to complete the look of your Remington 700 in the Accuracy International Chassis. NEW MFI Accuracy International (AI) Style Muzzle Brake for Remington 700 SLIP ON TYPE for .223 Caliber with Non-Threaded Barrel with O.D. @ 0.870". Unlike our other products this item is specifically for a VERY LIMITED MARKET and as such is made in very small volumes. Normal production for any other item is 1000 per year minimum. So it goes without saying we have to charge more money for these. We do our best to keep the price down for our valued customers. Still 1/2 the cost of the AI MB that would not fit anyway. Support the USA and "Buy American". These are designed specifically to complete the look for customers with the Remington 700 in AI chassis / sniper stocks. So if you have ever wondered why your Accuracy International Rem 700 does not look 100% complete... It is because you are missing the final accessory. 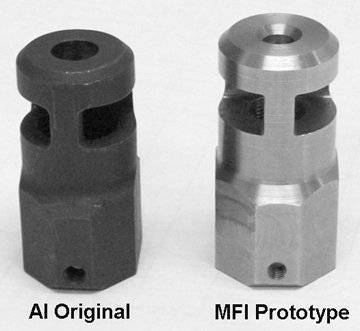 As you know AI does not make their Muzzle Brakes to fit any of the Remington 700 SPS, LTR, XCR, or other barrels. 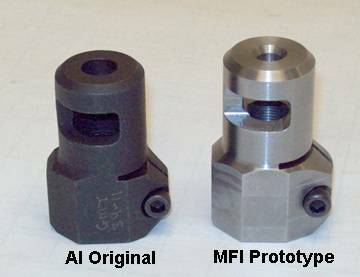 Additionally a genuine AI brake will cost you $250.00+ if you can find one and as the design is so old, even if you modified it to fit your barrel it would not be as effective as other single stage muzzle brakes on the market. We are NOT claiming to have the most effective muzzle brake on the market. We are focusing on the fact that we too wanted to have a cost effective product for the AI 700 platform that not only gave the correct look that we were lacking, but also was a more effective brake than the original A.I. brake. So we took the general looks of the AI brake and made a number of improvements. The original AI brakes are cast and lack any real clean up of casting marks. So while we were using a 100% CNC process we took a closer look at the internal area as well. We increased the effectiveness of the brake by enlarging the blast catch area. By increasing this area and reshaping the exit hole we believe we increased the effectiveness of the brake by at least 40% over the original. Thus all the negative reviews of the original AI Muzzle Brake are negated by this improvement alone. The MFI Brakes are CNC machined from solid billet weapons grade steel. Mil. Spec. Parkerized Dark Gray. Coating is very similar to the original AI color, perhaps a hair darker. Exit hole size is caliber specific for maximum anti-recoil effect. One of the huge mistakes of the AI brakes is that they all have the same size exit hole which is intended for the largest caliber at the time which was the .338 Lapua round. Obviously shooting a .308 or .223 caliber bullet though such a large hole decreases the downward force generated by the upward blast significantly. This is one of the biggest complaints that you find on any of the sniper forums. Improved anti-climb design on internal area CNC machined unlike the original cast AI MB. We also dished / chamfered the nose of the exit hole to more evenly disburse the remaining blast as the bullet passes through this area. This eliminates any chance of a negative vortex that would change the trajectory of the bullet in flight as it exits the muzzle brake. The set screw at the top is a 10-32 and is there to provide a dead center positive locking point if your barrel is milled for a center slot. If your barrel is not you can still use the set screw by marking the center point on your barrel to assure alignment with the muzzle brake. NOTE: The threaded hole on the original A.I. MB is there to attach the AI front sight. We did not match exactly the profile for the AI sight in this area as I personally would never buy $600.00 worth of iron sights for my sniper rifle. Our first prototype did match this profile, but it just looked wrong / fat on those angles, so we changed it to a more appealing shape. If you look at all the military photos shot in the field you will be hard pressed to find any with the sight in play. Basically while it is a good idea in theory to have back up sights it is almost never put in to practice in the field as it adds weight and is one more thing to get caught / snagged while stalking. Lastly all sniper teams carry back up weapons for this exact reason. Only you can determine the correct item to order by measuring the outer diameter of your barrel with a digital caliper. Reasonable quality calipers are available cheap on eBay and at Harbor Freight. Digital calipers are a must for any serious gun nut. Trust me on this... Spending $30.00 on a caliper is well spent and you will find it a very useful tool on a daily basis. The general rule of thumb here is that all Remington 700 Tactical style rifles have the same tapered profile from the 26" length going down. The O.D. from 26" to 22" is the smaller 0.830" and increases in size slightly as the barrel gets shorter / cut down. The Tactical models with barrels from 20" to 16" fall into the larger O.D. @ about 0.870". NOTE: I will offer inside diameter boring out to fit a larger barrel O.D. @ $35.00, but this will remove the Parkerizing. Weapons Grade Steel / Mil. Spec. Slip on / over your barrel with O.D. @ 0.875" to 0.855". Exit hole bored for .223 Caliber / 5.56 mm Bullet. Mil. Spec. Deep Gray Parkerizing. As close a copy of the original: We spared no expense to get these absolutely correct. Tolerance held is + / - 0.001 (less than the thickness of a piece of paper). Cost Effective: Highest Quality at the lowest price is always our goal. SPECIAL NOTE ON STYLE & TRADE NAMES: A.I., AI, Accuracy International as well as other marks, are Registered Trademarks of Accuracy International and are used on this web site for reference only. This item is NOT manufactured by nor endorsed by Accuracy International (A.I.). This trademark holder has NO relationship to this product, nor any product offered by MFI. This is NOT an exact copy of the in anyway of the original. We made sure that there were enough differences to avoid any conflict or confusion in the market place.